In today’s guest post we’re looking at how a few small changes can make all the difference. Enjoy! Most of us would snap at the opportunity to live in a luxurious mansion with high ceilings, oak flooring, a grand piano in the corner and walls casually adorned with original works from the great artistic masters of generations past. Sadly, there is no instant way to make this happen, short of staging a large scale bank heist. And this article certainly won’t be encouraging any such deviant behaviour. What it will do however, is suggest ways in which you can make your ordinary home seem extraordinary, through the addition of a few inexpensive but aesthetically luxurious tweaks. Often it’s the little things that make all the difference. And investing in a few artistic or stylistic additions is by no means an overly expensive undertaking. The art doesn’t have to be original Dali or Monet! Nor do your new door handles have to be solid gold plated! Often making your home classy on a budget is all about creating a veneer of luxury, without the associated costs. So perhaps consider visiting swap meets or garage sales in order to pick up original works of art at an affordable price. Of course, if you do still wish to have Van Gogh on the wall, a high quality print on canvas is always an option. And instead of throwing wads of cash into a ludicrously priced door handle, visit the Handle Store for something equally luxurious in appearance, and infinitely more pleasing in price. Lighting is far more important than many people recognise. You’d be amazed at how amateurish some of your favourite films would look like had the scenes not been lit correctly. The same applies to the lighting in your own home. Use it well, and you’re on your way to creating a masterpiece. Use it poorly, and your home is destined to be a flop. For this reason, you need to take extra special care when developing your home lighting scheme. Whilst there can be no substitute for strong natural light, you will want to develop mood and character through the use of ambient, accent and task lighting as well. Ambient lighting provides a solid substitute for the lack of natural light, whilst accent and task lighting truly allow you to sculpt mood and atmosphere within your home. 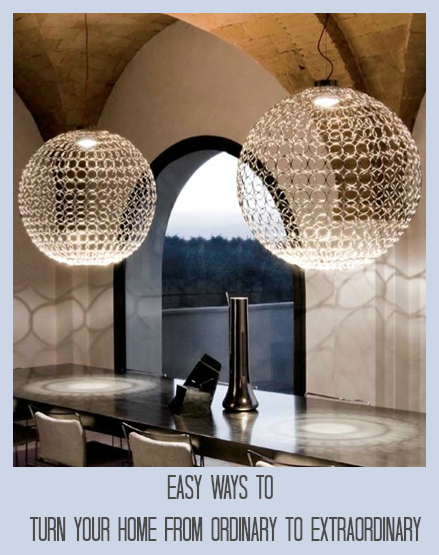 You can find a number of sources online which list in further detail the many ways in which you can use these specific forms of lighting. As much as you might think that a classy and luxurious looking home is beyond your grasp, it simply isn’t. Be employing some of the ideas here, you will be well on the way to turning your own home from ordinary to extraordinary.